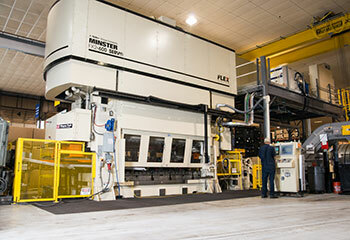 Bayloff Stamping Products is proud to announce that it has acquired a 600-ton Nidec Minster FX2 Servo Flex-Drive Press—the largest Minster Servo press built to date. The new press is fully operational at Bayloff’s main facility in Belleville, Mich., and features a closed-system, liquid-cooled Siemens drive to lower operating temperatures for longer motor life and less heat transfer to the press for a more stable production environment. Tapping into the press will afford Bayloff a complete line of press, transfer, coil line and quick die changes. The press’ standard hand wheel setup mode allows users to precisely position the slide for ultimate efficiency during setup and die tryouts. The FX2 Servo press has the highest snap-through rating in the industry, providing Bayloff and its customers with a high degree of flexibility in HSLA automotive applications, including challenging stamping applications, optimum tonnage, fully adjustable speeds and strokes, press rigidity and application flexibility. The press has a large intuitive operator interface incorporating many of Minster’s Production Management Control (PMC) programming, including complete integration with coil line components.